This year, Global Financial Integrity and Academics Stand Against Poverty will be awarding the sixth annual Amartya Sen Prizes to the two best original essays on assessing the human, social, political and institutional impacts of illicit financial flows out of Latin America as well as measures to curtail them in order to positively transform states and societies. Entered essays should be about 7,000 to 9,000 words long. There is a first prize of $5,000 and a second prize of $3,000. American societies cannot afford such losses of capital and tax revenues that greatly hamper their ability to mobilize domestic resources to provide services and policies needed toward sustainable development. indicator 16.4.1) and seeking to inspire effective political action toward reducing illicit financial flows out of Latin America, we are inviting essays that assess the human, political and institutional impact of such illicit outflows. Your entry may focus on one or more specific countries and on one or more specific kinds of illicit financial flows and strategies/policies to curtail, control or avoid them. It should then estimate the magnitude of these outflows as well as the damage they do to the institutions and to the affected populations – for example, through depressed investment and through reduced tax revenues leading to, inter alia, lower public spending on health, education, social security and development. We welcome authors from diverse academic disciplines and from outside the academy. Please send your entry by email attachment on or before 31 August 2019 to Tom Cardamone at tcardamone@gfintegrity.org. While you email should identify you, your essay should be stripped of self-identifying references, formatted for blind review. 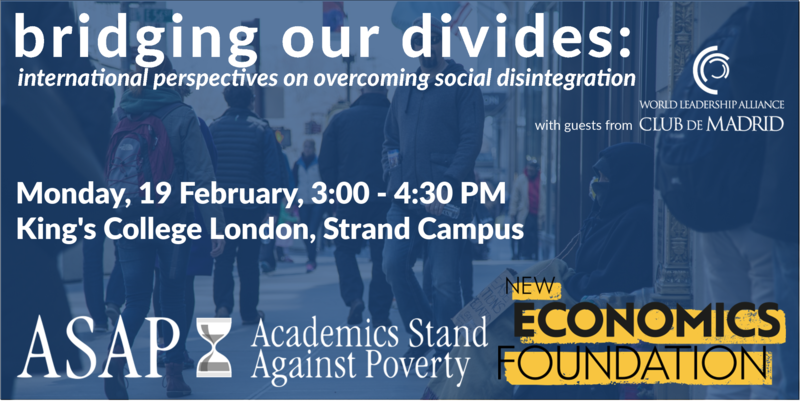 On February 19th, ASAP and the New Economics Foundation organized an exciting panel discussion at King’s College London with former Prime Ministers from Club de Madrid and other panelists. Background: We live in an era of division. Many countries around the world are suffering stark inequalities between rich and poor, young and old, metropolitan and rural, settled and newcomer. And this is driving new and potentially dangerous forms of politics to the fore. There is an urgent need for ideas and initiatives to bridge these divides and create a stronger, fairer society. Henrietta Moore, Director of the Institute for Global Prosperity at UCL, where she also holds the Chair in Culture, Philosophy and Design. The panel was chaired by Helen Yanacopulos, Professor of International Politics and Development at the Open University. The Club de Madrid is an independent non-profit organization created to promote democracy and change in the international community. Composed of 95 regular members, the Club de Madrid is the world’s largest forum of former heads of state and government. Its Shared Societies Project aims to challenge social divisions and supports a holistic approach to sustainable development, integrating social, economic and environmental dimensions, with social inclusion at its core. The fourth annual Amartya Sen Prize was awarded on 27 October, 2017 by Academics Stand Against Poverty and Global Financial Integrity for the best original essay on the moral assessment of tax dodging. This year’s recipient is Mattia Anesa, Postdoctoral Research Fellow at the University of Queensland, Australia. The award was presented during the first day of the conference Onslaughts on the Poor: Corruption, Emissions, Violence, jointly organized by Yale University, Academics Stand Against Poverty and Global Financial Integrity, during which Mattia presented his work to the conference audience. From 27 – 29 October, 2017, Academics Stand Against Poverty co-organized a four day conference covering topics related to global justice in partnership with Yale University and Global Financial Integrity. The title of this year’s conference was Onslaughts on the Poor: Corruption, Emissions, Violence. The second day of the conference featured attorneys Julia Olson and Phil Gregory from the landmark case Juliana v. United States, a constitutional climate lawsuit brought by youth against the United States government. Members from ASAP Chapters participated throughout the conference as guest speakers, including Maykel Ponçoni and Alan Pereira of ASAP Brazil, Francisco Saffie and Nicole Selamé of ASAP Chile, Diana Velica of ASAP Romania, Mladjo Ivanovic of ASAP USA, Maria Ginevra Cattaneo of ASAP Italy, and Pahlaj Moolio of ASAP Cambodia. The conference was preceded by a day of networking and workshops for ASAP Chapters on 26 October.